You know what I love? A house tastefully outlined in white Christmas lights. You know what I really don't like? Those inflatable lawn ornaments, especially the ones that look like giant snowglobes. And I mean, everyone's favourite holiday story is the one where the dinosaurs visited Baby Jesus, right? 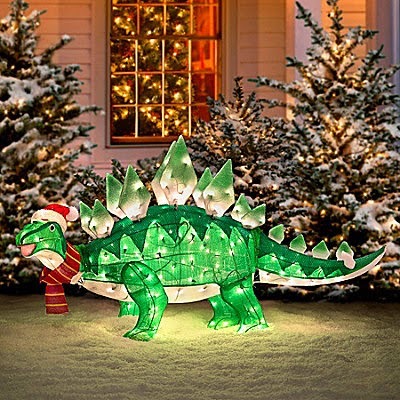 Seriously, if we had $155 to throw away spend, don't you think for a second that we wouldn't have a jaunty stegosaurus wishing all the neighbours Happy Holidays from our front lawn. Because dinos and Christmas is what the holidays are all about.